Few categories of antiques are immune to fakery; copies that manifest in varying degrees of passable authenticity, or at least at first glance. Fakes, replicas, copies – whatever one wishes to call them, have existed almost as long as the real thing and it’s been so for centuries and Chinese artisans have been considered the best at what is arguably an art in itself. The 21st century, however, has brought with it an new phenomenon that has created a sea-change in the world of antiques in all its guises; e-commerce. The dramatic rise in e-commerce platforms have seriously challenged established auction houses and antique dealers [and collectors] to such an extent that the age-old accepted way they have operated is challenged. The big issue, though, is that most e-commerce platforms impose no challenge to descriptions that are obviously mis-leading, or at least to the experts. The world of e-commerce changes at such a fast pace it is nigh impossible for established auction houses to devise ways to combat this in ways that their equally established clientele would find acceptable and appropriate for an auction house or up-market dealer to behave. This fragile equation is further complicated by the fact the majority of their clientele are probably not averse to making e-commerce acquisitions, a not insignificant proportion of which appear at mainstream auctions at a later date. This, though, is where one would expect reputable auction houses’ radars to pick up the warning signals such pieces emit; sadly, this is rarely the case. Chinese ceramics have long been afflicted with fakery. Serious collectors have developed their own methods to determine authenticity, none more so than the Chinese themselves. When I first began researching the silver category generally known as ‘Chinese Export Silver’ some eight years ago, fake items of this silver were almost non-existent; values, however, were relatively low at that time. This reality no longer exists. The past three years have seen an increasing sophistication, if you will, in the quality and appearance of copies to the extent that workshops and even entire factories exist solely for the production of what could now be considered a parallel industry; I have personally seen some of these factories. Copies are no longer exclusive to Qing Dynasty silver; in the past two years items have consistently appeared for sale, some of them in highly reputable selling situations, that are replicating items of silver from very early Qing as well as late Ming reigns. To an experienced eye, most should be detectable, many being almost too good to be true. Chinese export silver, or what I far prefer to call Qing Dynasty silver since it far more accurately describes the actual silver objects that generally fall within this category, is probably the most mis-understood silver category on the planet; despite popular opinion, it is also one of the largest silver categories since it was produced over 285 years involving up to 50,000 silversmiths, artisans and workshops operating across that period. Even with a substantial amount being destroyed in the late 19th century and 20th century for a variety of reasons, a huge amount remains and it keeps up a steady appearance in the general market. It also happens to be a silver category that is perceived completely differently in the West than it is in China by the growing number of Chinese collectors and experts; a difference that the West barely recognises, if at all. When I first began my research, not one mainstream auction house deemed the silver to be of significant importance. To my knowledge, to this day no auction house has a dedicated expert for this silver category and in instances where a silver department exists, those silver experts will invariably refer to marks that appear on English or in Latin initials as being the “maker’s mark”; the reality is that mark will almost always be a retailer’s mark and the true maker’s mark when it appears will be in Chinese characters, often referred to as the chop-mark. The growing number of Chinese collectors, however, will usually ignore the retailer’s mark as being irrelevant [to them] and will not only be able to read the maker’s marks, but also distinguish those which they deem as being more “collectible” and by default command a much higher value. This dichotomy of perception, understanding and appreciation of the silver already presents a very complex and probably unique situation. Enter into that equation the fact that certain items of this silver have the capability of achieving unusually high values and then factor in the existence of fakes that require its own specialised knowledge to detect, Western auction houses and dealers should find themselves being in a dangerously weakened position; a position that seems not yet to have been fully realised, if at all. While there was a provincial pride in American China Trade cities that assumed that goods owned by the old merchant families came directly from China to their towns or city and remained there, this was not necessarily the case. It is safer to regard Philadelphia as having been a distribution point for as much as one third of all the China goods entering America at the time. Some of these goods would have found their way to commission merchants, some to retail silversmiths, some directly to dockside auctions. What it does demonstrate is how these goods and the China Trade itself became an important historical marker of the new nation and most importantly to become an integral part of early American cultural heritage. Academics who have an affinity to the decorative arts are often faced with the dilemma whether an important item is made all the more remarkable if it commands a high value or whether that high price enhances its significance. The answer is probably in the affirmative to the former but despite the fact the Wanli silver censer [above] succeeded in attracting a final bid in excess of $700,000, the relevance the censer has in establishing a new understanding for the subsequent Qing Dynasty silver genus is simply beyond value; it is tantamount to discovering a long-lost strand of the DNA of the Qing Dynasty silver genus, tantamount to a eureka moment. 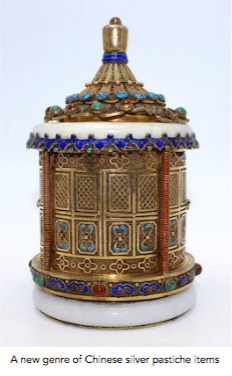 It is perhaps most relevant to highlight the fact the censer was sold in a Hong Kong auction, having been part of a mainland China beauty parade prior to crossing into Hong Kong. In China, the use of e-commerce sites is far more widely used than in the West. In the larger cities in China, cash is already almost redundant. Alibaba have created ‘Rural Tiaobao’, an ambitious effort to turn China’s 600 million rural residents into online shoppers — and, most importantly sellers. Alibaba is getting a big helping hand from the government, which is footing the bill to renovate actual [as opposed to virtual] storefronts in rural areas, sending officials out to talk up e-commerce to once skeptical farmers, providing gratis space for new logistics centres and deploying propaganda workers to promote Rural Taobao. The ministries of commerce and finance have allocated $300 million to 200 rural counties to spend on warehouses, training and anything else that might push the project forward. This is now revolutionising entire villages – Rural Taobao is helping farmers sell their produce at higher prices and to buy things more cheaply; rural entrepreneurship is a new and fast-spreading reality. Dedicated local appointed agents help their technology-challenged neighbours to buy fertiliser, TVs and even electric cars that are specially made for the Chinese rural market on the Alibaba rural shopping site. The same agent arranges the payments as well as delivery and earns a commission from the sellers. This is dramatically changing the wealth dynamic of the rural poor; this, in a country that already has an affluent middle class greater than the entire population of the United States. Alibaba’s research arm estimates online consumption in rural China will reach RMB 1 trillion by 2020; Alibaba recognised the problem, created a solution and implanted it in less than one year. Alibaba will invest 10 billion yuan to build 100,000 Taobao service centres in remote areas and expand logistics and training to bring villages up to speed for how to Taobao-ize their economy. The central government has signed agreements with both Alibaba and Jingdong [JD.com], another major platform, to spur e-commerce development in the name of poverty alleviation. Taobao “entrepreneurs” [for that is how they see themselves] have already started put feelers out across Asia and even to America. Where communist slogans still abound in rural districts, farmers swap their tractors for Audis. China’s online shopping revolution has created hundreds of ‘Taobao villages’ – farming communities transformed by the Alibaba consumer-to-consumer site of the same name; a whole different kind of communism, if you will. Meanwhile, back at the Western auction world, an entirely new ‘species’ of so-called Chinese export silver items proliferates. Posing as “18th or 19th century” and even “Ming”, often sporting pastiche dynasty marks that border on being ludicrous, they range from silver gilt filigree [actually factory-made mesh] and enamel pieces to a vast array of silver wares that have no comparable pedigree in the real world. This new-born genre is exactly that; hot-off-the-press of factories and workshops that are geared up to spew them out; so obviously gaudy and not authentic in any way, yet they are selling for not inconsequential sums of money. Almost every item is obviously new, or at least to an expert, however experts in the true silver genus are very thin on the ground. Apart from the mainstream auction circuits, the fake items particularly thrive on the Western e-commerce platforms where sadly virtually no attempt is made to verify authenticity. E-commerce platforms, however, have developed their own hierarchy; we have those that have evolved specifically for a more up-market clientele, while others are geared more to a mass market. Sadly, though, the lack of authenticity control remains, in the main, equal, but more worryingly the ability or desire for auction houses and dealers to recognise them should set warning lights flashing. It is almost tantamount to the reticence of social media platforms to take real responsibility for filtering out “fake news; those platforms have their cake and can eat it, while the platform users are left to fend for themselves in the equivalent of a digital minefield. Add to the hazard the appearance of so-called auction houses that seem to have their whole reason for being rooted in offering articles of dubious provenance and age; allusions to items being part of “estates” that themselves are fictitious are not uncommon in a bid to elevate their pedigree, is just one example of a new generation of auction boxes of tricks. Back in China, the most populous nation on earth and one that is probably the most open to embrace a digital world, it verges on the frightening for a Western visitor to equate the extent of this digital acceptance to anything that comes anywhere near it back in the West. China is creating almost all the new precedents and benchmarks in this new parallel virtual world and is doing so at a momentum approaching the unstoppable force of a tsunami. Chinese people also seem to have the ability to be generally more street smart with regard to digital information and how it is purveyed. China Guardian, the smaller of the “big two” Chinese auction houses open its new headquarters only two blocks away from the Tiananmen Square side of the Forbidden City any day now; known as the Guardian Art Centre, it is the world’s first museum and auction house hybrid that includes the wholly integral 120-room Puxuan Beijing Hotel & Spa whose main function is to cater for China Guardian’s most prestigious domestic and international clientele. Yet again, the Chinese are raising the bar and even though relatively speaking China Guardian remains a small-fry in the global pond of auction houses, Guardian are obviously on a whole new mission to challenge the establishment of the auction world; this, after all, is a minnow that also happens to own a substantial tranche of Sotheby’s shares. Anyone who has ever attended a China-Guardian preview in the past 18 months will have detected a marked upward trajectory in style, presentation, quality of offering and achieved values. China Guardian has also been quietly populating its corridors with world-class experts. 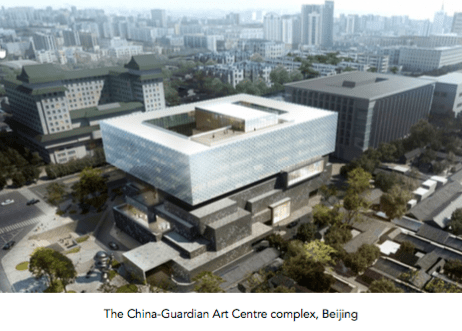 The Guardian Art Centre is a whole new Chinese auction hybrid; auction house, luxury hotel and spa, convention and auction space, art storage and conservation space, educational institute and publishing house all under one roof in a district where only the largest Ming palace in the world and vast forbidding government office complexes have ruled up until now. China Guardian is also known to be actively looking for new innovative ways to present art and artefacts to the world; virtual reality is but one of the new technologies being investigated. 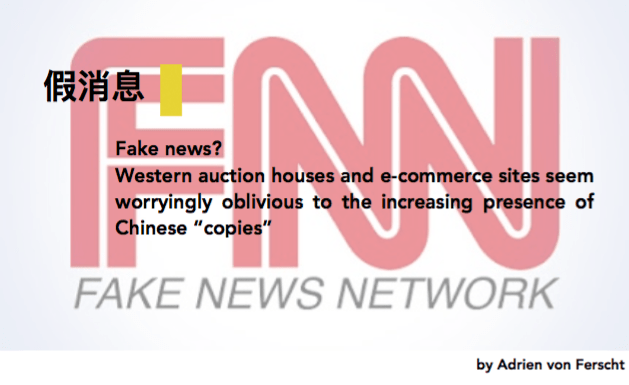 The West is lagging embarrassingly behind, meanwhile Chinese generated fakery is undermining the integrity of a world that has not yet even begun to play catch up in the West, let alone get its house in order to stop the incessant march of the fakes. Lagging behind seems to be the one thing the West is good at; how many Western nations have truly climbed aboard the One Road, One Belt initiative? The auction house bar, meanwhile, continues on its rapid upward trajectory, as do most other Chinese-led initiatives.